😢 Crying Face Emoji is a sad face with a tear running down your cheek. This can only mean one thing: you are sad about something. Not so great a tragedy to scream, swear and stamp feet, but nevertheless quite seriously. Such a lonely tear can be caused by some nostalgic memories, disappointment, or a small failure. Self-reliance can also be a reason to get a little teary. 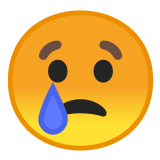 Crying Face Emoji was approved as part of Unicode 6.0 standard in 2010 with a U+1F622 codepoint, and currently is listed in 😀 Smileys & Emotion category. 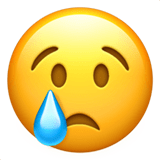 Use symbol 😢 to copy and paste Crying Face Emoji or &#128546; code for HTML. This emoji is mature enough and should work on all devices. You can get similar and related emoji at the bottom of this page.